When I wrote my first self-published novel Into the Badlands, I simply worked on it when the mood hit. I wrote most days, but not every day, and I had no real sense of how much I was getting accomplished day to day or week to week. Over the course of 210 days I wrote 84,000 words. That’s around 400 words per day. My next book, The Desolate, was written in a similar fashion. Over the course of 120 writing days I wrote a 70,000 word first draft. That’s 583 words per day. Better, but not great. My latest novel, Beyond the Badlands (the follow up to Into the Badlands) has seen 114 writing days so far. It’s nearly completed now, sitting at 105,000 words. That works out to 921 words per day. You can see the trend here: I’ve more than doubled my daily word count since my first novel. There are some reasons for this. For one thing I’m a better writer now. I can write more, faster. But that only goes so far. I was a little better when I wrote my second novel, but it was written at a pace only slightly faster than the first novel. The secret is the daily quota. 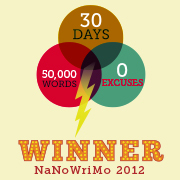 I’ve set a daily quota of 1,000 words for myself. I’m not quite hitting it, but you can see here that I’m pretty damn close with this latest book. That word count is always nagging at me, each and every day I wake up. I know that if I don’t make my quota for the day then I’m going to be playing catch up over the weekend. If I don’t put in the extra work to get caught up then my release date will slide. But the daily word count is a means to an end. The real end is the finished novel. So when I project out my year, I see it as 365 days. Using 90,000 words as the average novel, that means I can finish the first draft in three months. Add in another two months for revisions and another month with the manuscript out to the editor and I’ve just written and published a book in six months. That’s my ideal time frame. If you took my 90,000 words and averaged them over six months instead of three months, you’re not going to get 1,000 words per day. But the 1,000 word per day quota is necessary for me to write and publish a book in six months. So the quota isn’t a mindlessly ubiquitous daily word count for the entire year, it’s a purposeful number required for a period of time in support of the larger deliverable: the novel. Your goals and your counts will vary. That’s not the point. The point is, if you figure out what you want to produce and how long it will (actually) take you to produce it – and then stick to those quotas – you’re likely to see an increase like the doubling in word count I did. If you’ve been at the writing game for some time, then this is something you probably already know. But if you’re fairly new to the game like me, then maybe this shift in thinking will be helpful for you. This year I’ll publish two novels instead of one, simply because I use my time more wisely now. And since books sell books, having more books available is a good thing.